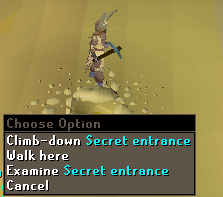 Begin by speaking to Lazim, found south of the Desert Bandit Camp. 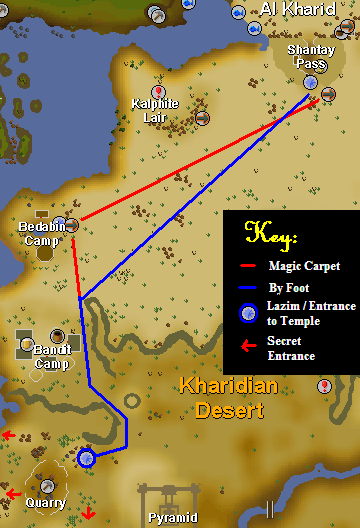 Lazim is located south of the Bandit Camp, and you can get there by either walking from Shantay Pass, or taking a magic carpet ride to the Bedabin Camp, and then walking. The Secret Entrances marked are used to get into the Enakhra's Temple later on in the quest, but cannot be used until you have opened them from the inside. This can be done by climbing the ladders in the rooms with light streaming in, then climbing up the sandpile to get out. To start the quest, talk to Lazim. He tells you that he wants you to construct a new statue to the kings, and asks you to get him 32kg of Sandstone for the base. Sandstone can be mined in the Quarry to the West of Lazim, and is mined in blocks of 1kg, 2kg, 5kg or 10kg; the higher your Mining level, the more likely you are to get a larger block. The amount of Sandstone you give to Lazim has to add up to 32kg - he won't accept more than he needs, but he will hold blocks for you while you mine more. It is recommended that you drop smaller blocks when you get them at first, as it can be tedious giving him one tiny chunk, going through another conversation, giving him another chunk and so on. 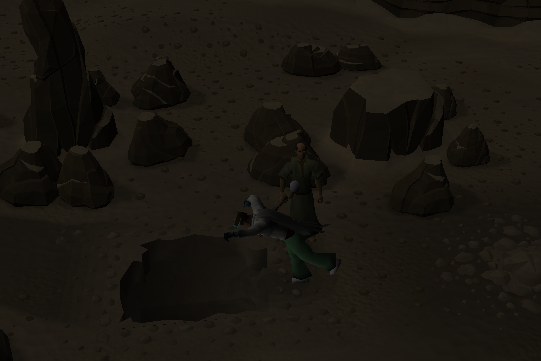 When you have given him the correct amount, he will perform a spell and turn it into a 32kg Sandstone Block for you. 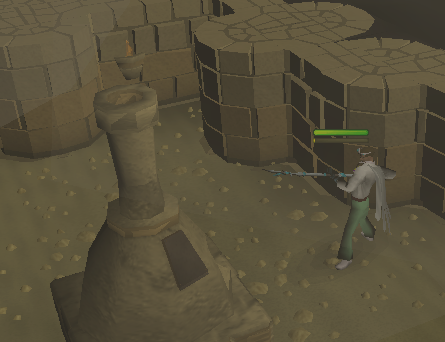 Use a chisel on it to get a Statue Base, talk to Lazim and then use the base on the flat piece of ground beside him. Next you have to get 20kg of Sandstone, using the same process as before. Use the body he gives you on the statue, then use your chisel on the statue to neaten it. You will end up with a headless statue. 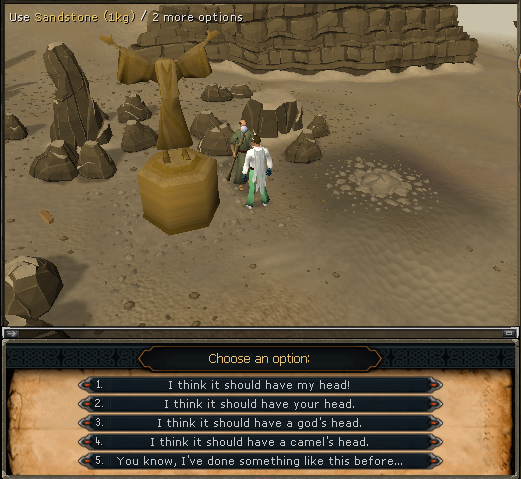 Talk to Lazim, and you will have to choose what type of head the statue should have. You can choose any, except for your own! For the head, you will need to mine a 5kg block of granite. Granite can be mined in blocks of 500g, 1kg, 2kg or 5kg. 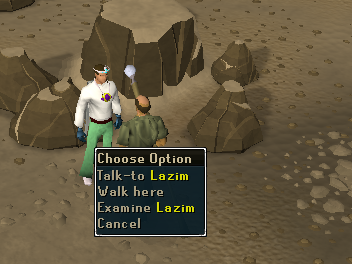 Use the chisel on it to make the head that you chose when speaking to Lazim. If you have 7 or more spaces, mine an extra 5kg block of Granite; you will need it, but you can mine it later on if you are short of space. Use the head on the statue, and it will fall, making a hole into which you fall! Note: You cannot enter through this hole later, and the desert effect does not affect you whilst inside. When you speak to Lazim, he will explain that he purposely made you make the statue so that he could get into temple to find treasure! So you decide, like the head-strong adventurer you are, to help him find this treasure. In the temple, as Lazim says, the doors are unlocked with limbs! However, before you go trying to cut your arms off, you can remove the fallen statue's limbs by using a chisel on it; these, along with the Sigils that you find along the way, are the keys to the doors. 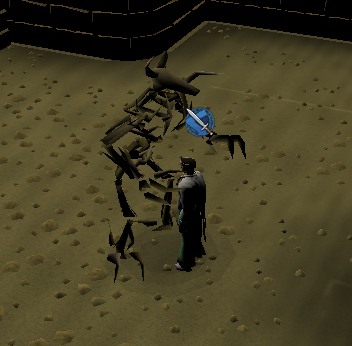 While talking with Lazim, you should ask for the head of the statue, and before leaving, take the "M" sigil from the pedestal. Also, you may wish to climb up the ladder and the sandpile so you can access the temple easily again. Firstly, head south and try to open the door with a recess for a right leg. You will blackout and see a black-and-white flashback with Enakhra trying to summon a Boneguard from some Big Bones, but she fails. When you wake up, head through the door and follow the corridor into the chamber and take the "R" Sigil from the pedestal. 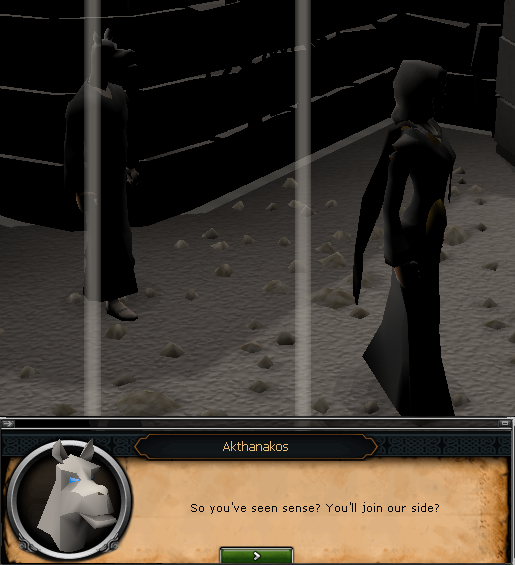 Open the door to the west, to see another flashback where Enakhra persuades Akthanakos that she has joined their side. Take the "K" Sigil, and move through the door to the north to see a third flashback where Enakhra kills the knights defending the Temple! Take the last Sigil, shaped "Z" and head through the door to the east. Follow the corridor and speak to Lazim again, then head west to a locked door with an imprint of a Sigil. To open it, use the matching Sigil with the door, and you should unlock the other doors with the other Sigils whilst you are there. Afterwards, climb the ladder. You will find yourself on a floor with four rooms centered around a pedestal with the imprint of a camel's head and a Magical Barrier. To open this Barrier, you need to complete four tasks on the floor. Head south-west and you will find a Frozen Fountain. Cast the Fire Spell you brought with you on the fountain, and it will melt. Note: If you have not brought wet clay, you can fill your bucket from the Fountain to moisten it. You can also refill your waterskins if you brought a bucket. Use the wet clay with the Pedestal to get a Stone Head Mould (p), then, if you didn't have space for the 5kg of Granite before, go back through a Secret Entrance and quarry some. Then use a chisel on the block of Granite to make a Stone Head. If you wish, you can use another piece of wet clay on the Pedestal to make a Camel Mask, but this is not necessary for the quest. Speak to Pentyn, in the room north of the Fountain, and he will think that you have come to torture him again! Of course, being a generous adventurer, you should use a Cake on him. He will eat it and give you some information on how to clear the Furnace. Next, head east to the room with the Furnace, which should appear quite misty. Use an Air Spell on the Forge to clear it. 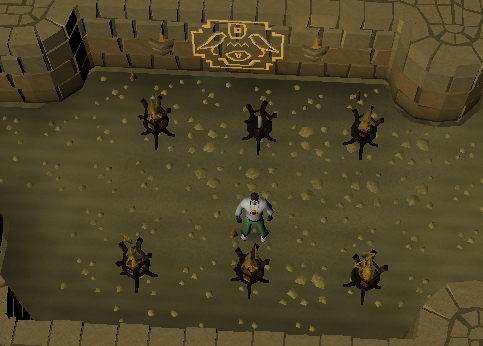 Go into the final room, and you will see six braziers. Investigate each of the braziers to see what it requires, and add the Maple, Willow, Oak and Normal Logs, Candle and Coal to the correct brazier to light up the room. When you are finished, you will see that the orbs on the outside of the Pedestal have lit up. 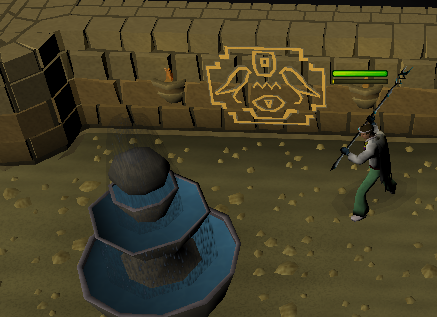 Use the stone head that you made earlier on the pedestal and you will be able to pass through the Magical Barrier. 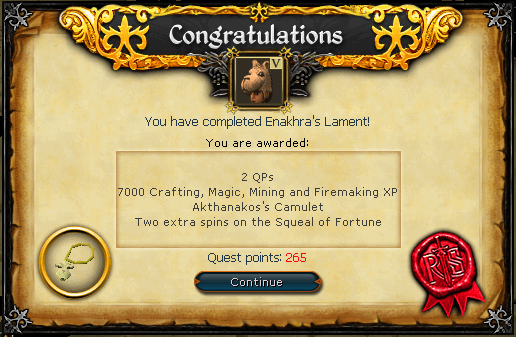 You will also see a final flashback where Enakhra uses Ancient Magicks on Akthanakos! Climb up the ladder, and cross the room, climb over Bone Pile and then down the ladder. Speak to the Boneguard. He will tell you of his struggle, and asks you to help finish walling Enakhra inside her own temple. 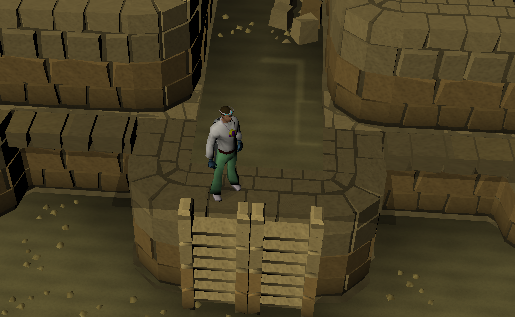 To repair the wall, take some blocks from the pile near the Boneguard (5kg blocks of Sandstone). First you have to "place" the brick by using one with the wall, and then "trim" the new bricks by using a chisel with it. 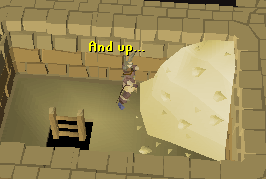 Repeat this process until the wall is finished, then speak to the Boneguard to receive the quest reward. 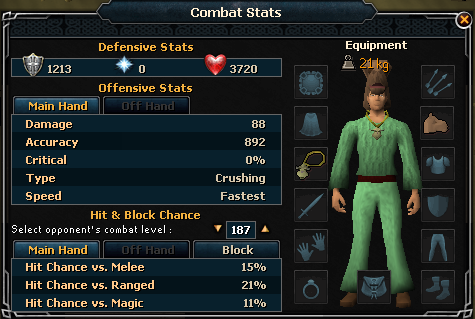 It turns out the bone guard is Athankos!. 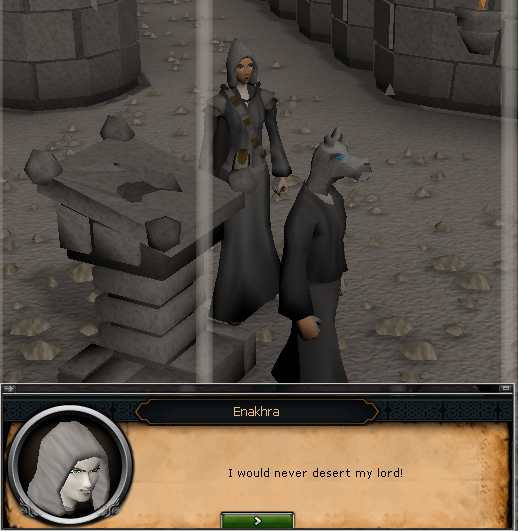 You will see a cutscene where Enakhra and Akthanakos call for help from their gods, and Enakhra escapes. 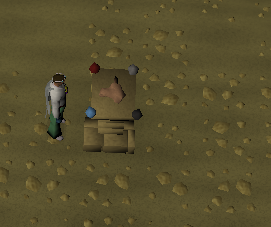 This amulet allows you to speak to Camels and Ugthanki when worn, and teleports you to Enakhra's Temple when rubbed. It has four charges, and can be recharged by using Camel Dung on it. If lost, Lazim will give you another. [^] Mine 32kg of Sandstone, give to Lazim (can be given in smaller amounts). [^] Chisel 32kg Sandstone Block into Statue Base, use it on Flat Ground by Lazim. [^]Get 20kg of Sandstone, give to Lazim, chisel block to make body. [^] Use Sandstone body on statue, use chisel on statue. [^] Talk to Lazim, choose head type. [^] Mine 5kg block of Granite, chisel into correct head. [^] Use head on statue. 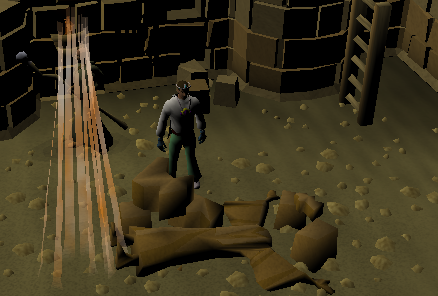 [^] Chisel limbs off Fallen Statue. [^] Talk to Lazim, get head back, take Sigil off pedestal. [^] Taking the 3 other Sigils on the way, head through the southern door, through western door, then north, then east. [^] Talk to Lazim, head west, using correct Sigil on door; it is advised to unlock other doors with other Sigils. [^] Cast Fire Spell on Frozen Fountain in south-western room. [^] Use a wet clay on pedestal, go back to Lazim, climb up ladder and sand pile, quarry 5kg block of Granite. Chisel into stone head, return to pedestal. [^] Use Cake on Pentyn in north-western room. [^] Cast Air Spell on Furnace in north-eastern room. [^] Light Braziers with correct fuel in south-eastern room. [^]Use stone head with pedestal. [^]Climb over pile of bones and head down ladder. [^]Repair the wall by taking blocks, use with wall then use chisel on it.